For the protection of sheep and lambs against pulpy kidney, lamb dysentery, blackleg, tetanus, braxy, struck, black disease and pasteurellosis. Dosage 2ml. Refrigerated Product. POM-VPS. Combined 7 in 1 Clostridial plus Pasteurella vaccine. An opaque fluid vaccine containing per ml: Clostridium perfringens beta toxoid : inducing ≥ 10 IU ; Clostridium perfringens epsilon toxoid : inducing ≥ 5 IU ; Clostridium septicum: toxoid : inducing ≥ 2.5 IU; Clostridium tetani toxoid: inducing ≥ 2.5 IU; Clostridium novyi toxoid :inducing ≥ 3.5 IU; Clostridium chauvoei cells and equivalent toxoid : inducing ≥ 0.5 guinea pig PD90, formalin killed cells of the epidemiologically most important serotypes of Mannheimia haemolytica and Pasteurella trehalosi grown under iron restricted conditions: 5x108 cells per strain in buffered physiological saline adsorbed onto aluminium hydroxide. Thiomersal is included as a preservative. Sheep of all ages: 2 ml per injection. All breeding sheep not previously vaccinated with Heptavac P Plus must receive two injections, each of 2 ml, separated by an interval of 4-6 weeks. Thereafter they must receive booster injections at intervals of not more than 12 months. In adult breeding ewes these yearly booster injections should be given during the pre-lambing period, 4-6 weeks before lambing, as an aid in control of disease in their lambs. Ewes may be vaccinated during pregnancy as an aid in the control of lamb dysentery, pulpy kidney, tetanus and pasteurellosis in their lambs provided that the lambs receive sufficient immune colostrum during the first 1-2 days of life. On farms where the incidence of pasteurellosis is high, a supplementary booster injection using a Pasteurella vaccine may be required 2-3 weeks prior to expected seasonal outbreaks. 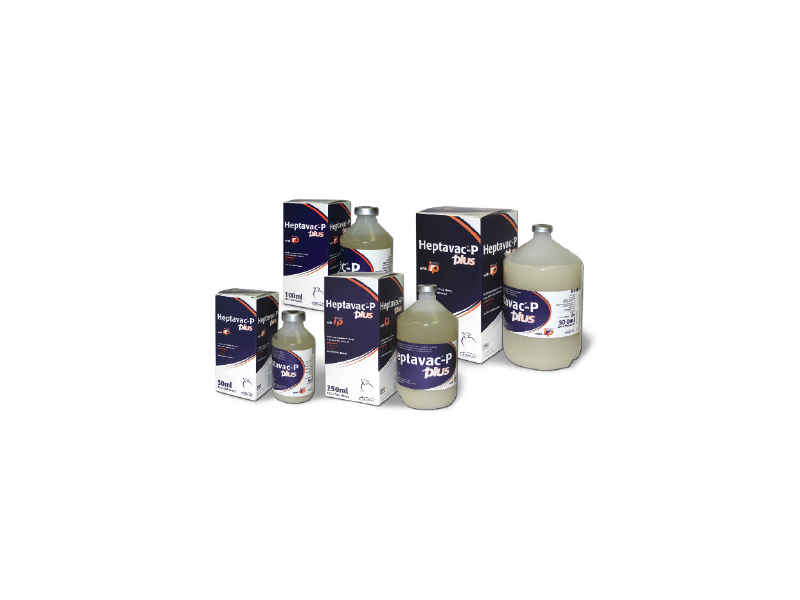 Heptavac P Plus should not be used in lambs less than 3 weeks of age due to the possible immunological incompetence of the very young lamb and competition from any maternally derived colostral antibodies. Lambs being retained for fattening or subsequent breeding will require a full course of vaccination. At a minimum age of 3 weeks these lambs should receive two injections, each of 2.0 ml, separated by an interval of 4-6 weeks. It should be noted that Heptavac P Plus is the recommended vaccine for breeding stock since it provides optimal aid in the control of the predominant clostridial diseases in adult sheep by active immunisation and in young lambs by passive immunisation. It is recommended that an automatic vaccinator is used. Since the bottle containing this product is non-collapsible a vaccinator with a vented draw-off spike or similar device must be used. The instructions supplied with such syringes should be noted and care should be taken to ensure the delivery of the full dose, particularly with the final few doses from the bottle. Syringes and needles must be from gamma irradiated packs or freshly sterilised by boiling for at least 20 minutes. No alcohol or other disinfectants should be used for sterilisation. Once opened, use of the vaccine must be completed within 10 hours. Evidence of efficacy of the Pasteurella component of Heptavac P Plus was generated in an experimental infection model and it is not possible to provide duration of immunity information using this system. There are reports that active immunity will last for up to one year and that passive immunity will persist for up to 4 weeks after birth in lambs from ewes vaccinated with conventional Pasteurella vaccines. Heptavac P Plus has been developed following research and development which resulted in the application of Plus ‘IRP’ technology for the manufacture of the pasteurella components of this vaccine. The inclusion of these IRP components should provide enhanced efficacy and cross protection e.g. protection against serotype A12, which is not included in the vaccine, has been demonstrated. Studies on the response of sheep to this vaccine show that two injections separated by an interval of 4-6 weeks are required to gain the full benefit of the ‘IRP’. In any group of animals a small number of individuals may fail to respond to vaccination as a result of immunological incompetence. Satisfactory immune responses will only be attained in healthy animals, thus it is important to avoid vaccination of animals which have intercurrent infection or metabolic disorder. As with most killed vaccines, significant levels of immunity cannot be expected until two weeks after the second dose of vaccine in the primary vaccination course. The nutritional and metabolic status of pregnant ewes is extremely important at the time of vaccination. If in doubt consult your veterinary surgeon for advice. When handling sheep, stress should be avoided, particularly during the later stages of pregnancy when there is a risk of inducing abortion and metabolic disorders. Because sheep are very sensitive to contamination of the injection site (which may result in non-product related tissue reactions and even in abscesses), it is advised to follow strict aseptic injection techniques. Vaccination may result in small transient injection site reactions, usually characterised by swelling, possibly lasting for up to 3-4 months after vaccination. Occasionally hypersensitivity reactions may occur. In the event of an anaphylactic reaction appropriate treatment should be administered without delay. In the case of accidental self-injection seek medical advice immediately and show the package leaflet or the label to the physician. Store at +2°C to +8°C in the dark. Do not freeze. Use before the expiry date printed on the pack. Low density polyethylene containers of 50, 100, 250 or 500 ml with rubber closure and aluminium cap. There are currently no questions for MSD Heptavac P Plus - be the first to ask one!